Long before today’s road-dominated freight transport service, there was a line that bypassed the city of Manchester, to the south. This route connected the Manchester Sheffield & Lincolnshire Railway (later the Great Central Railway) from Sheffield with the Cheshire Lines route between Manchester and Liverpool. On its way, it connected with almost every other line in the district to create a vital artery for goods traffic. Much of the coal finding its way to south Lancashire and the docks at Liverpool passed along this line from the pits of Yorkshire and Derbyshire. Goods from the docks also used the line to reach the conurbations east of the Pennines, and of course, every loaded coal and goods wagon produced an empty one to be returned for refilling. Certain sections of the route were amongst the most intensively worked freight lines in the country. The reader is taken along an imaginary journey from west to east, stopping at all the stations and other important railway features along the line. 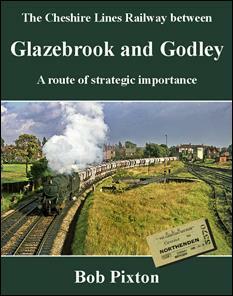 While the main focus of the book is the route between the two towns, the traffic and the connections generating it are explored as they arise along the journey. From the author of the popular “Liverpool & Manchester” trilogy.